We consider differential-pulse position modulation (DPPM) in an ultra wideband (UWB) communication system. A typical format for a DPPM signal in a UWB system is derived from that of a pulse position modulation (PPM) signal. The error probabilities of a UWB DPPM system with receive diversity over additive white Gaussian noise (AWGN) and Nakagami fading channels are derived. Both single-user and multiuser environments are considered. Performance results are presented which show that the frame error rate (FER) with DPPM is better than that with PPM, and the FER performance can be improved significantly by receive diversity. PPM has been used extensively in optical communication systems and is the modulation employed in the IEEE 802.11 infrared physical layer standard . However, PPM adds complexity to the system since both slot and symbol synchronization are required at the receiver in order to demodulate the incoming signal . Thus DPPM has been proposed as an alternative to PPM [3, 4]. DPPM provides a higher transmission capacity by deleting redundant slots in a symbol. It does not require symbol synchronization since each symbol ends with a "1" pulse. In recent years, DPPM has drawn wide attention as a promising modulation scheme for optical and short range radio communication. In , the code properties and spectral characteristics of a type of DPPM called digital pulse interval modulation (DPIM) were discussed. The probability of error with DPIM in optical wireless communication systems was also presented; in , the packet error rate (PER) was derived for a simple threshold detection-based receiver. It was shown that the PER of DPPM for a given average received irradiance was superior to that with on-off keying (OOK), but PPM was better than DPPM. For a given bandwidth, DPPM was shown in  to require significantly less average power than PPM. The performance of DPPM in the presence of multipath intersymbol interference (ISI) was also examined. A hybrid modulation technique called differential amplitude pulse position modulation (DAPPM) was recently proposed in . DAPPM is a combination of pulse amplitude modulation (PAM) and DPPM. The symbol structure and properties of DAPPM, for example, peak-to-average power ratio (PAPR), bandwidth requirements, and throughput, were compared with other techniques such as DPIM. Most research on DPPM considers only optical communication systems. This paper examines DPPM for use in UWB systems. The typical format of a DPPM signal in a UWB system is derived, and the error probabilities over AWGN and Nakagami fading channels are derived. Both single-user and multiuser environments are considered. Receive diversity is employed in the UWB system to improve performance. This can be achieved using a RAKE receiver or multiple receive antennas. The remainder of this paper is organized as follows. In Section 2, the signal construction and system model over Nakagami fading channels are introduced. Section 3 presents the error probability analysis of the DPPM UWB system over both AWGN and Nakagami fading channels in a single-user environment. The performance of the DPPM system in a multiuser environment is analyzed in Section 4. Numerical results on the system performance are given in Section 5. Finally, some conclusions are given in Section 6.
where is the number of pulses that form a data symbol, is the UWB pulse of duration , and is the energy per pulse. The pulse repetition interval is . is the time-hopping code, and is the PPM time shift, where we assume ,  . where and is the time slot duration. A DPPM symbol is obtained from the corresponding PPM symbol by deleting all of the "0" slots that follow the "1" slot, as shown in Table 1. In contrast to PPM, where a symbol has fixed length , the DPPM format generates a variable-length symbol since the "0"s after the "1" have been dropped. Comparison of Symbol Mapping for 4PPM and 4DPPM. where is AWGN with power spectral density is the propagation delay of the signal sent by the th user, is the received pulse waveform, and is the receive diversity order. Receive diversity can be achieved using a RAKE receiver or multiple receive antennas. For simplicity, we employ equal gain combining (EGC) at the receiver in the following discussion. where denotes the Gamma function, , and with . To make the channel characteristics analyzable without affecting the generality of the channel, we further define as a random variable that takes the values +1 or −1 with equal probability. where . Thus are zero-mean, mutually statistically independent Gaussian random variables with equal variance . where is the probability of frame error, is the number of symbols in a frame, and is the probability that the th symbol is in error. where is the symbol SNR of the UWB system over an AWGN channel. The equivalent SNR is the symbol SNR modified according to the number of paths and the fading coefficients. With a simple variable transformation, the error probability of -ary DPPM over Nakagami fading channels can be obtained by substituting for in (25). The probability of frame error can then be expressed as (19). With more than one user active in the system, multiple access interference (MAI) is the major factor limiting performance. The net effect of the MAI produced by the undesired users at the output of the desired user's correlation receiver can be modeled as a zero-mean Gaussian random variable if the number of users is large or a repetition code is used with . Based on the multiple access error probability of -ary PPM , in this section, the multiple access error probability of DPPM system is investigated. By modifying the noise distribution, the error probability analysis given in Section 3 for a single-user can be extended to multiple access systems. This agrees well with the single-user analysis. The instantaneous SER for a multiple access UWB system with DPPM can be obtained by substituting given by (51) in (25), and the frame error probability of a multiple access DPPM system can be obtained from (19). In this section, some analytical and Monte Carlo simulation results are presented to illustrate and verify the error probability expressions obtained previously. Figure 1 compares the FER of PPM and DPPM over an AWGN channel with a frame length of 128 bits. The results for binary PPM verify the analysis given previously. 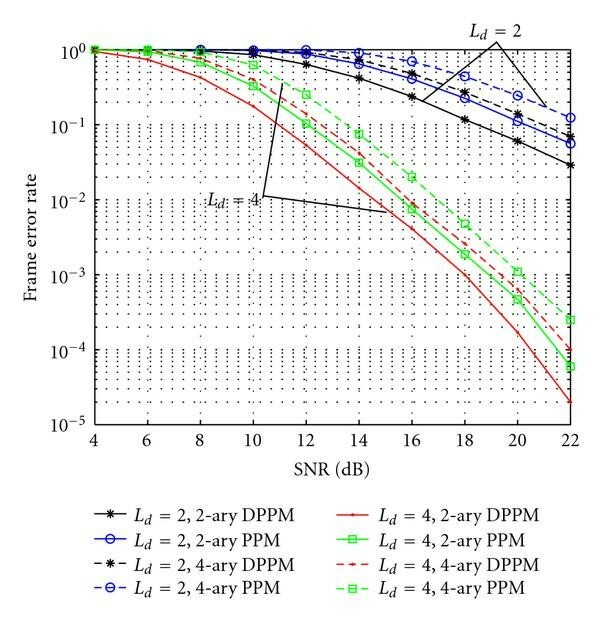 This figure shows that DPPM is superior to PPM in terms of FER performance. Figure 2 shows the corresponding FER with a frame length of 512 bits. 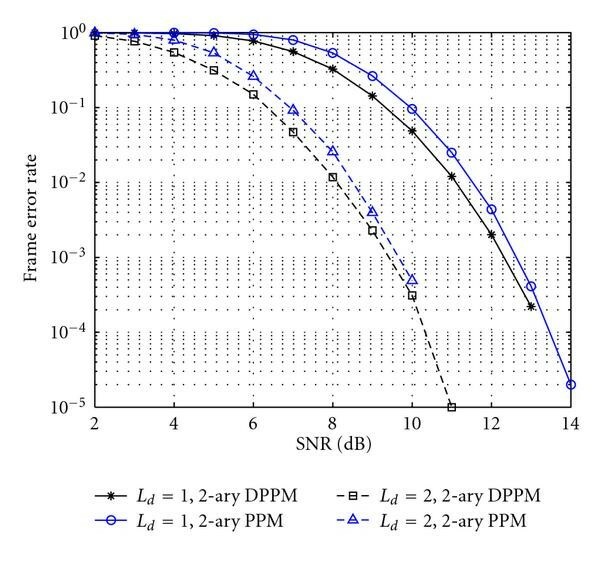 Compared with Figure 1, the FER performance is worse due to the greater number of bits in a frame, but DPPM provides a similar improvement over PPM in both cases. Figure 3 gives the FER of binary PPM and binary DPPM with receive diversity orders and over AWGN channels, with a frame length of 128 bits. This shows that the FER performance is improved due to the increased diversity order. 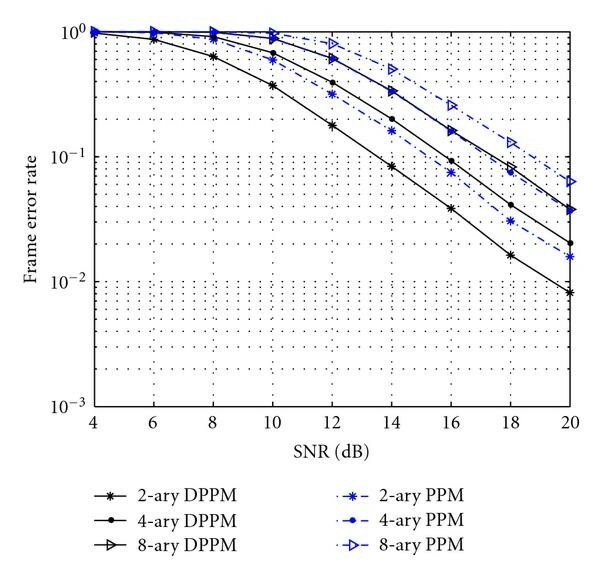 For binary DPPM, there is almost a 3 dB gain with two receive antennas over one receive antenna at an FER of 10−2. Frame error rate for PPM and DPPM over an AWGN channel with a frame length of 128 bits. Frame error rate for PPM and DPPM over an AWGN channel with a frame length of 512 bits. Frame error rate for binary PPM and binary DPPM with receive diversity order , and a frame length of 128 bits over AWGN channels. Figure 4 shows the FER for 4-ary DPPM over Nakagami fading channels with different . A larger corresponds to improved channel conditions. As expected, the FER declines with increasing . 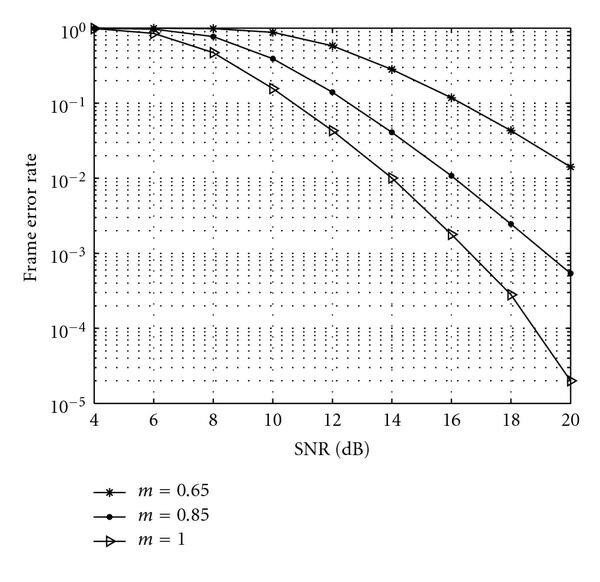 At an FER of 10−2, there is about a 2 dB gain with over , and more than a 6 dB gain with over . Figure 5 shows that DPPM also has a superior FER in Nakagami fading channels. It also shows that receive diversity has a significant impact on the FER. At an FER of 10−1, there is about an 8 dB gain with 4 receive antennas over 2 receive antennas for 4-ary DPPM. Frame error rate for 4-ary DPPM over Nakagami fading channels with different , a frame length of 128 bits and receive diversity order . Frame error rate for -ary PPM and -ary DPPM with receive diversity order and a frame length of 128 bits over a Nakagami fading channel, . Figure 6 shows the relationship between FER and the number of users for -ary DPPM with receive diversity over AWGN channels. The FER performance of -ary DPPM deteriorates rapidly with the number of the users due to MAI. For 8-ary DPPM, the FER is close to 10-1 with about 260 users. Thus -ary DPPM is not suitable for large wireless networks with many users. 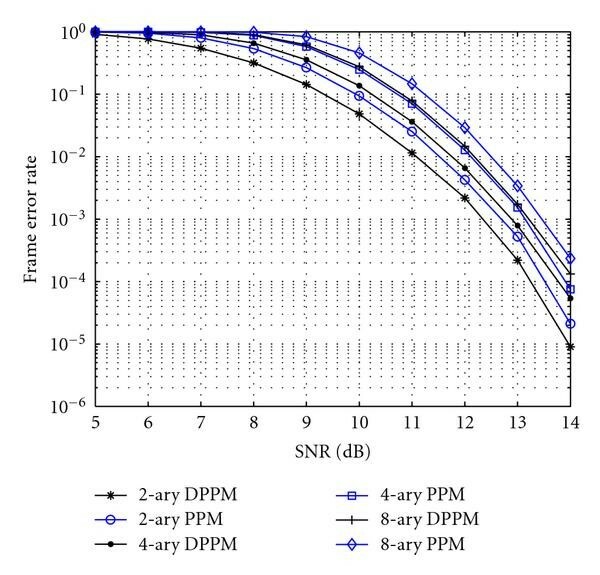 Relationship between frame error rate and number of users for -ary DPPM with receive diversity , and a frame length of 128 bits over an AWGN channel, , SNR = 8 dB. Figure 7 gives the multiple access FER of -ary DPPM and -ary PPM over Nakagami fading channels with receive diversity. 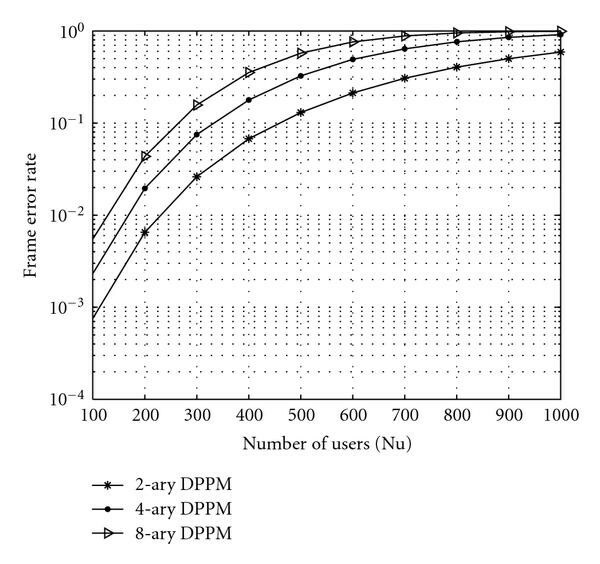 DPPM is again superior to PPM in terms of FER performance in a multiuser environment. The FER performance of 8-ary DPPM is about the same as that of 4-ary PPM. Multiple access frame error rate for an -ary DPPM UWB system with receive diversity , and a frame length of 128 bits over a Nakagami- fading channel, , , and . The error probability of DPPM over AWGN and Nakagami fading channels with receive diversity has been studied. Both single and multiuser cases were considered. The FER performance was first derived for AWGN channels and then extended to Nakagami fading channels by averaging the SNR over the channel random variable. Exact error probability expressions were derived, and Monte-Carlo simulation was employed for efficient evaluation. 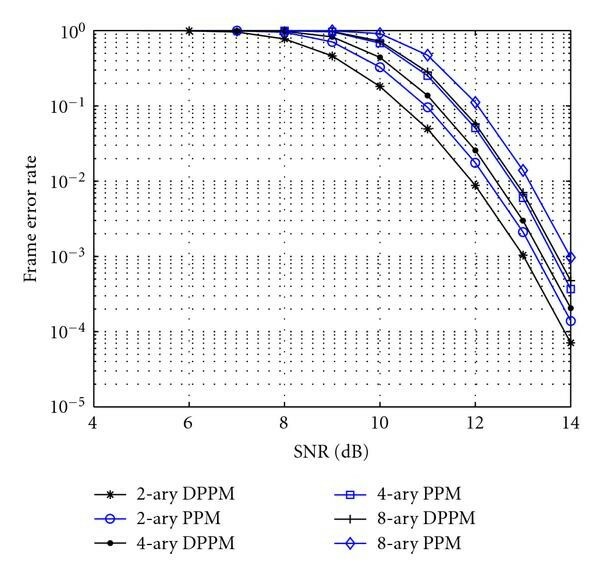 It was shown that for a UWB system, DPPM is superior to PPM in FER performance over both AWGN and Nakagami fading channels, and the FER performance can be significantly improved by employing receive diversity. This work was supported by National 863 Hi-Tech Research and Development Program of China under Grant no. 2007AA12Z317, New Century Educational Talents Plan of Chinese Education Ministry under Grant no. NCET-08-0504, and Shandong province Nature Science Foundation under Grant no. JQ200821.